3:46 A.M…..excitement allover as I write this…..cup of lemon water in hand….Sugarcane bourbon brûlée on my mind…. It was a date with Nana, Amaks and H-Baby. 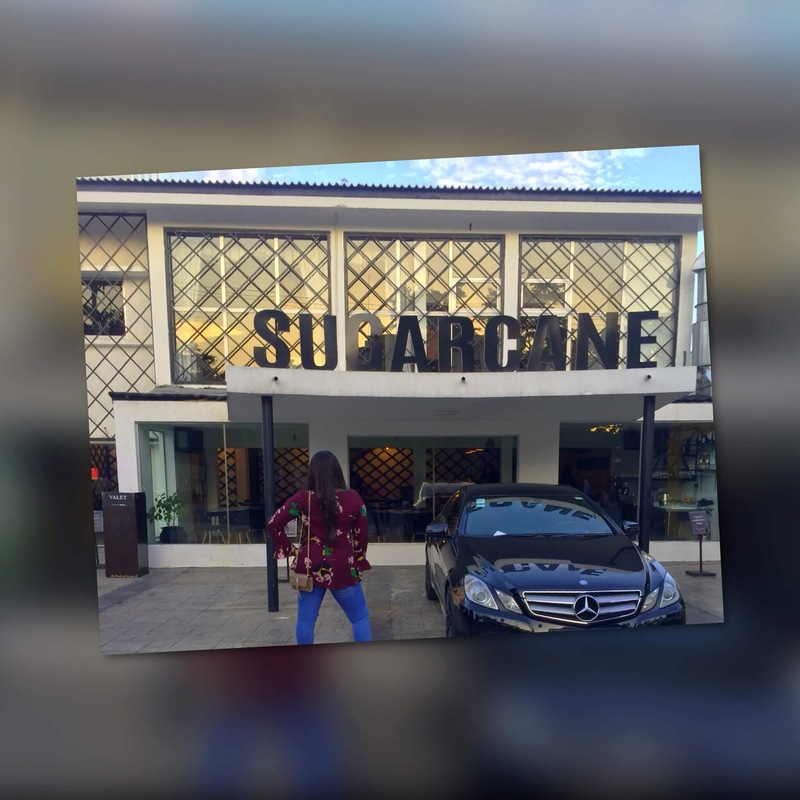 After a lot of debate on destination, we finally agreed to try out Sugarcane, a restaurant in Victoria Island, Lagos….maybe because their Instagram feed @sugarcane.ng steady hunts us…. First impression was a good one, they offer valet parking services as their parking might require some technical skills for those of us who find it hard to park in line. On our way in, I realized the restaurant windows were open and the owner of the car in the picture had been watching us pose beside his baby *laughs* That had me sold on the space as I imagined eating here alone on a quiet morning and watching people on the street go about their business. It’s amazing to watch people just live their lives when they don’t notice others looking at them. Next good thing, we had a staff welcome us at the door and he got us settled in nicely. The menus came with a cinnamonish popcorn that wasn’t sweet enough for me, I’m guessing they don’t want our palettes overwhelmed before the meals. At this point, I realized I didn’t like the lighting here….quite dim especially for me who wants to photograph everything. Drinks came at a good time after ordereing…. Amaks and H-Baby were in no mood to experiment so water and chapman for them Frozen spiked chapman for Nana…. I didn’t try it out but I suspected that anything frozen and spiked with rum had to be good…. Nana confirmed my suspicion Bourbon brûlée for me just because it contains sherry, I was in the mood to act like a vintage chic and the brûléed orange was a perfect touch….super fancy *big smile* Taste was good too. We waited a little longer than expected but finally the food came….. I had been craving pesto for a while so that had to be my pick with breaded chicken….magnifique! Pasta; cooked perfectly, pesto sauce; earthy and fresh, chicken crust; light and crisp, chicken itself; tender and juicy. This meal is highly recommended…. Nana also went the pasta route but tagliatelle jollof (long flat ribbons of pasta). What’s not to love about a dish that has jollof mix, shrimps, chicken and sausages? I was supposed to have 2 fork fulls but I stole 2 extra, the spice was giving me life! Amaks is presently on a healthy eating journey so she got a shrimp and avocado taco salad. You see the top has what? 8 pieces of shrimps….as soon as she ate them up, the meal became boring even to my eyes. Please we don’t want to spend almost N5,000 on a shrimp based dish and get only 8 pieces. The amount of cabbage in the plate was overwhelming and it was taken back almost the same way it came….sad! Best for last….sticky bbq ribs! At first, we teased her for wanting to spend N12,000 on food alone, I remember saying “it had better be really good or 12k gone!” and we laughed but it came and was very worth it. We fought over the ribs like kids. Amaks was there the next day or so just to have a full plate of these ribs to herself Anything that makes her put a pause on her diet must be amazing so yes, highly recommend! Overall, my Sugarcane experience was a good one, I would love to go back for their breakfast…. …..Even though I had two issues with them. First; their POS machine wasn’t working when it was time to pay, although they made someone follow us to an ATM to avoid the stress of coming back, I believe restaurants should always have atleast three bank’s POS machines given the epileptic nature of Nigerian banks. Second; the valet hands your keys back with a numbered sticky paper, call me lazy but I had that thing on for days. It would be nice to get my keys back just the way I dropped it. Nana slept over and wouldn’t let me eat my breakfast in peace so I whipped her up a pasta dish inspired by both her jollof and my pesto…. I couldn’t find basil so I used mint, chicken, sausages, tomato paste, paprika, black pepper, garlic, onions, dried thyme and twists…..nom nom…. If I ever make it to Nigeria I’ll try this place. Looks great! It’s always been my dream to travel there. One day! Awesome write-up. Pics on point! I’ve been to sugarcane nice restaurant. Hi! Thanks for the like 🙂 just enjoying your blog. Great descriptions I love when people love food! I look forward to reading more! Everything looks great. Your pictures are so nice. awesome write-up as always. i see u going places, dear. compliments of the season to you and yours.